This Conference Update was provided by Molly Schoen, Information Resources Specialist for the Visual Resources Collections at the University of Michigan. Sessions at the conference were wide-ranging and informative for both information and imaging professionals alike. I think what’s unique about the visual resources profession is it brings together librarians and photographers, media specialists and art historians. The VRA has done an excellent job in fostering these dynamic relationships. The array of events was similarly dynamic and diverse, from traditional sessions to roundtable discussions, workshops to lightning talks, museum tours to networking lunches. Key themes at this year’s conference included new technologies, visual literacy, digital humanities, intellectual property, and all things metadata. VRA individuals are a dedicated bunch, committed both to preserving the past and establishing standards for the future. Groups such as the Slide and Transitional Media Taskforce are working to set guidelines to preserve the precious images and data from at-risk analog media, prone not only to physical decay but also disposal by administrative units interested in saving space. Others are invested in digital preservation, which faces parallel challenges as files are migrated and formats change. Throughout the conference, the passion and creative forces at work were evident, from Greg Reser’s embedded metadata developments on Adobe Bridge, to William Sealy and Chris Strasbaugh’s innovative open-sourced cataloging workflow tool (DIMLI), to the resonating speeches given at the Members & Awards Dinner by lifetime achievement winner Maureen Burns, which moved some to tears. The approachability of VRA members, even those with impressive titles and long trails of accomplishments, is unparalleled. Events such as the Welcome Reception, New Members & First Time Attendee Breakfast, and the Sponsors Meet ‘n’ Greet and Poster Sessions all encouraged friendly mingling. 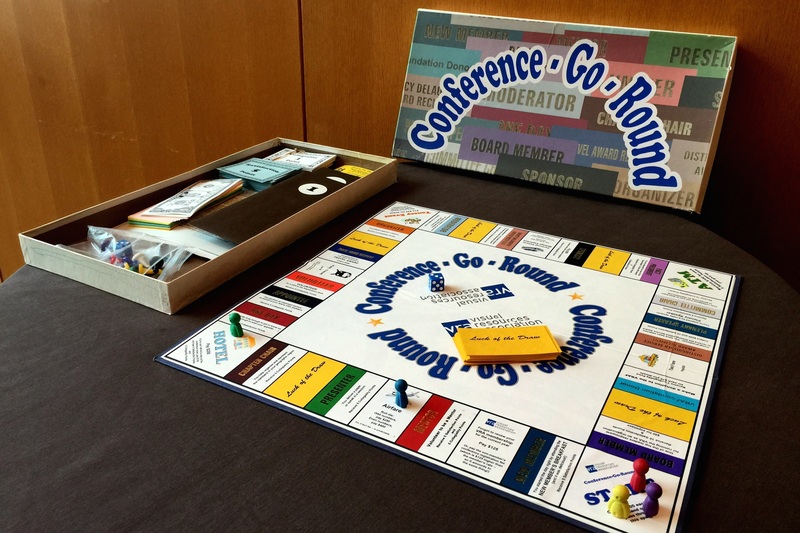 Near the registration desk was a make-your-own-art-button station and a conference board game, supplying additional settings for chance interactions—and fun—among all VRA people. The conference planners also did away with name badge ribbons this year, putting all members on an equal level. Something that I’ve found most striking about the VRA since I joined two years ago is the vast amount of support and opportunities available for students and new professionals. The conference boasts a mentor/mentee program, significant travel awards to help cover expenses, loads of events for new members, and easy pathways into leadership roles. Some have even gone from new member to board member in just a year or two. Facilitating relations between new and veteran members alike is the Visual Resources Emerging Professionals and Students group (VREPS), which I co-chair. VREPS is aimed at providing a sounding board for new VRA members as well as providing career development opportunities. This year’s VREPS events at VRA included a job searching workshop, a meeting / open discussion, and the VREPS Night Out—a low-key gathering at a nearby bar. A fierce shuffleboard competition during VREPS Night Out. The 2016 conference is a joint effort with ARLIS/NA (Art Libraries Society of North America), which means there’s even more to look forward to. This was my third time attending VRA, and I can’t wait to do it all again in Seattle next year!